This is a really cool bar sign that was commissioned by the owner to dedicate a space to display pictures of deceased relatives and patrons in his bar. This sign features a raised skull and crossbones detail along with hand carved lettering. This is a uniquely designed sign that was designed for a customer’s residence. This sign features a carved and painted fish to reflect the customer’s love of fishing. This is a uniquely designed sign that was designed to uniquely display the address for a trailer sitting on two campsite lots. 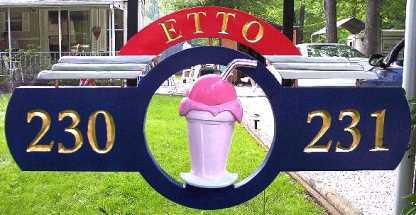 This sign features a cut out detail with a 1950’s malt shop theme. 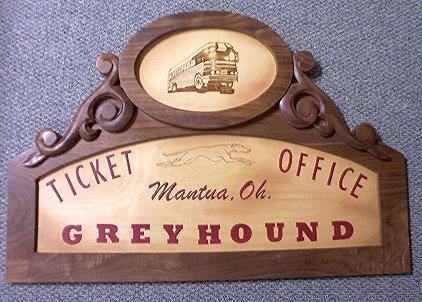 Studio reproduction of a vintage Greyhound sign. This sign was made from black walnut and featured hand painted and wood burned details.